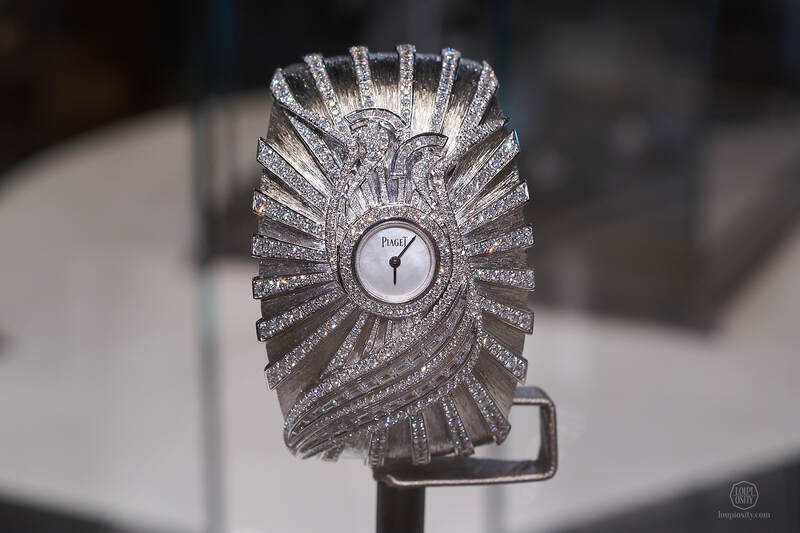 In the presence of Piaget’s CEO Chabi Nouri, Piaget international brand ambassador Jessica Chastain and face of the campaign Doutzen Kroes, Piaget launched its new Sunlight Escape High Jewellery collection this June in Palais d’Iéna. 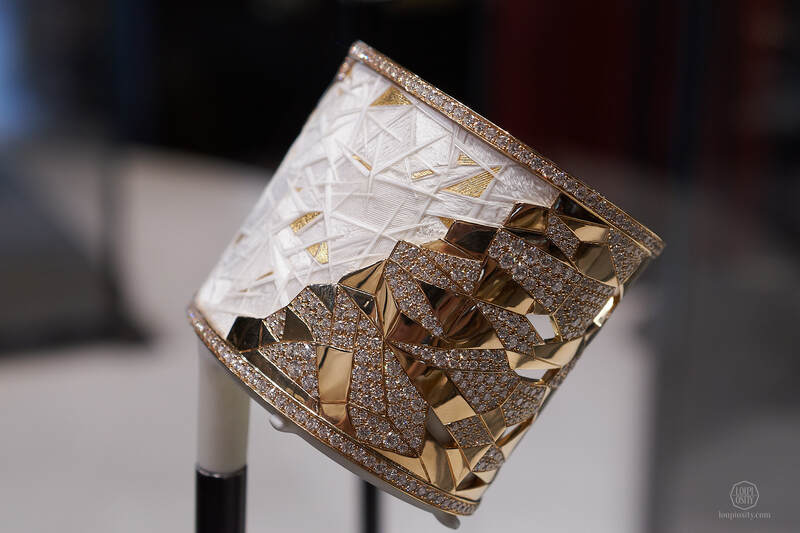 We saw the pieces during the Paris Fashion Week at the Piaget boutique on Rue de la Paix. 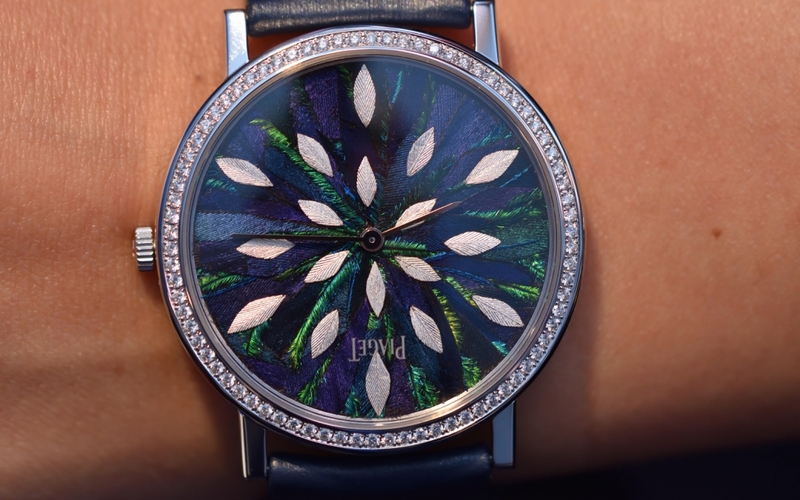 I am a big fan of how Piaget uses non-precious materials on jewellery, such as the fantastic ‘feather marquetry’ they do with Nelly Saunier (see previous creations here and here). 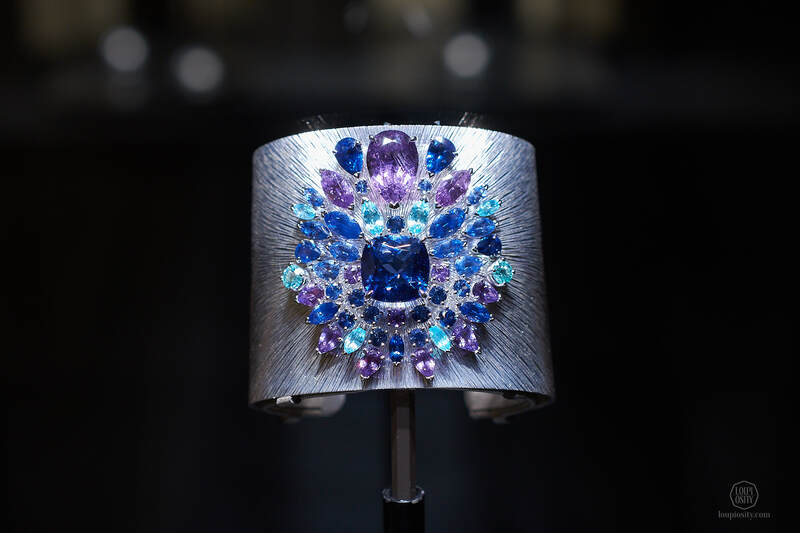 These are examples of how creative imagination can manifest in pieces created in a collaborative process. 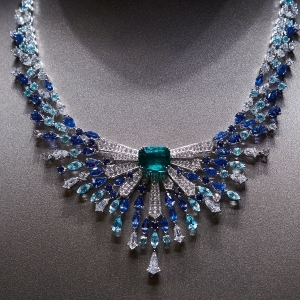 Especially because jewels in the collection should also have common features that are recognisable. 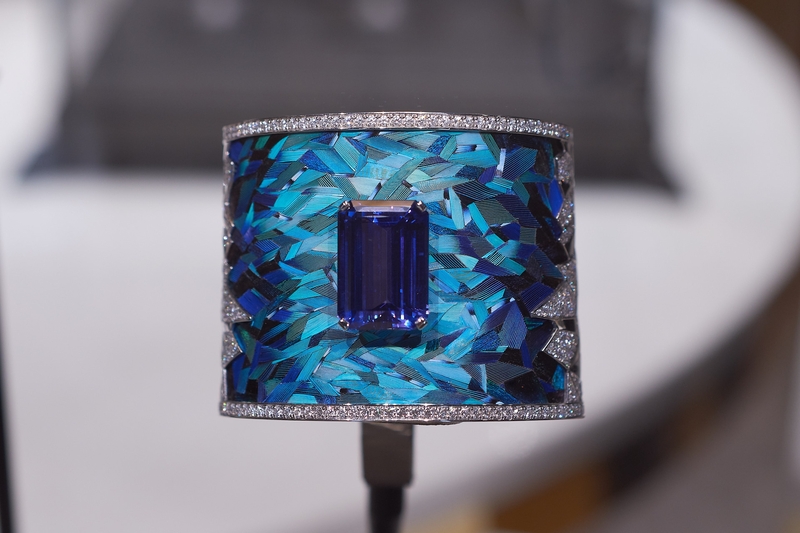 This is a very interesting topic on its own and therefore I was very happy to talk with Stephanie Sivrière (Director of Jewellery and Watchmaking Creation) and Jean-Bernard Forte (Watch and Jewellery Marketing Director). 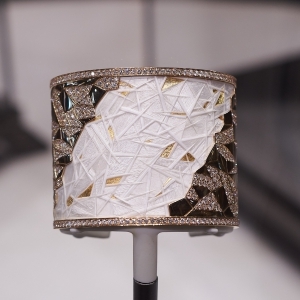 Stephanie explained that they met Nelly at an event a few years ago and they began exploring how feather could be used to adorn Piaget pieces. 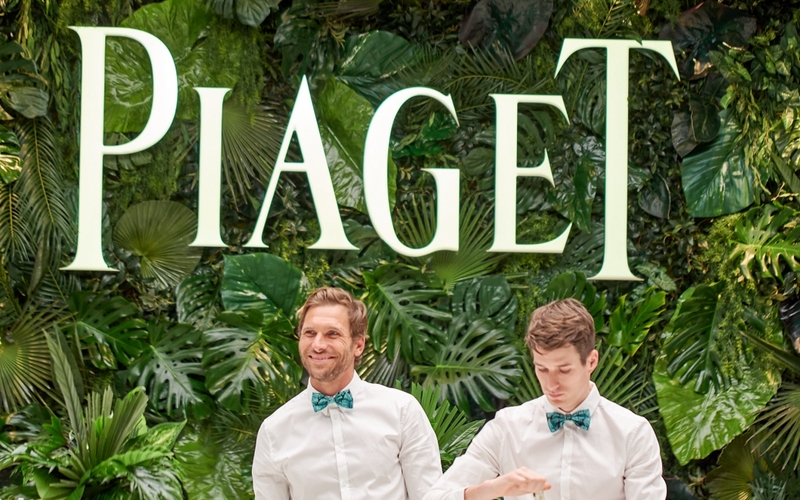 The creative team at Piaget works on the collections two years in advance on average – this includes the creative process but also the time until the necessary gemstones and materials are obtained and set. 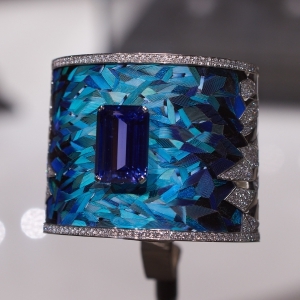 Sometimes it is difficult to find the right qualities as many of them are extremely rare. Others should be perfectly matched too. 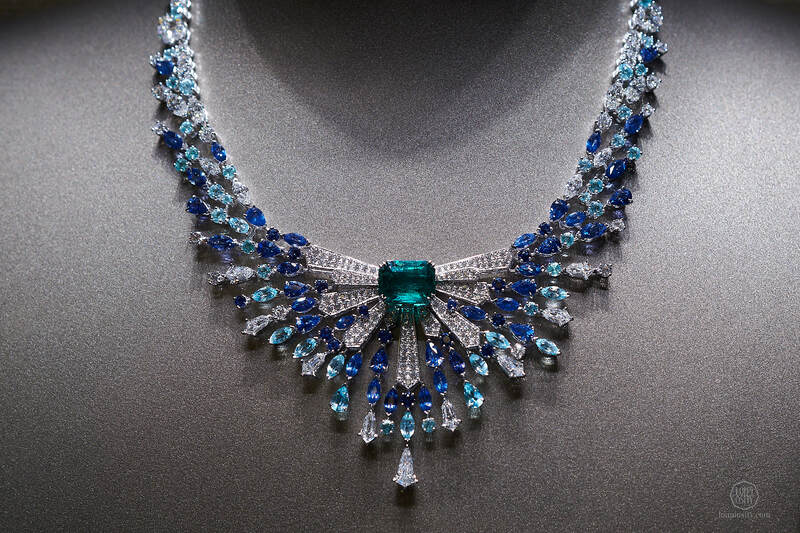 Collections would typically have a common theme, but the individual high-jewellery pieces can approach the topic from different angles. 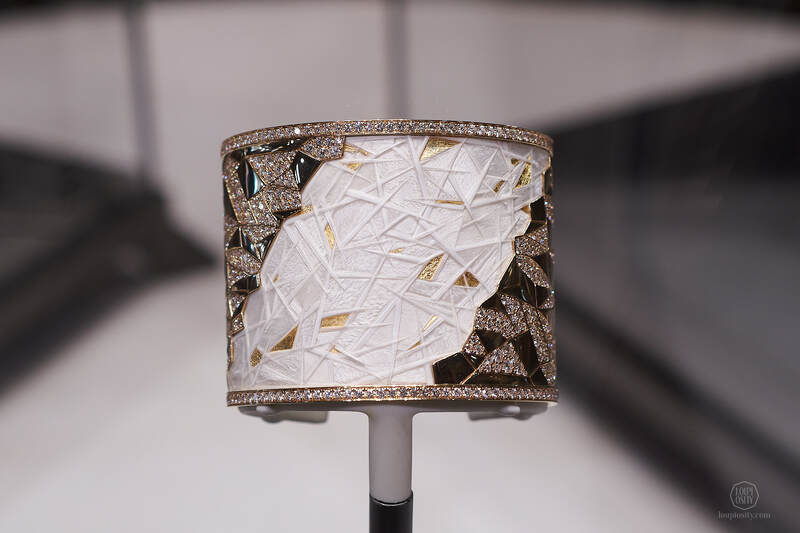 In regards to the feather marquetry models, Nelly Saunier received great freedom to shape the pieces her way. 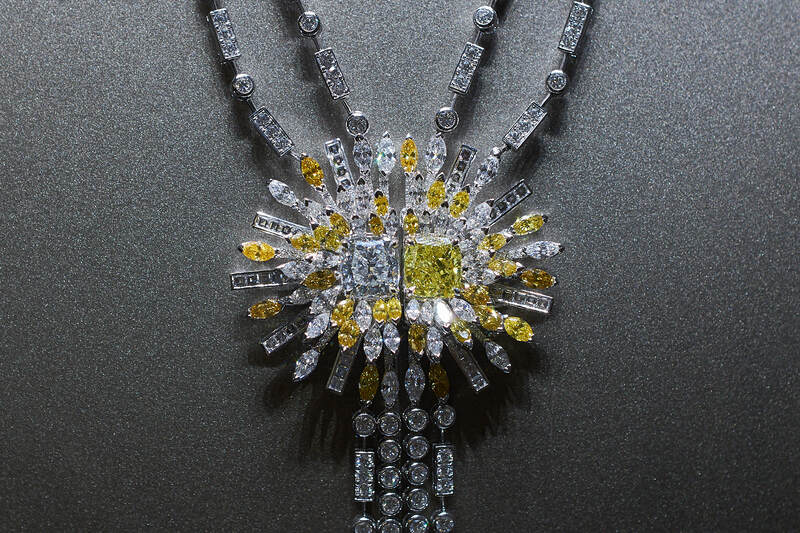 Piaget has taken us to the Sunny Side of Life many times. This journey has touched glorious places like magical buildings and sceneries of Venice and Samarkand; the glitzy and cosmopolitan Swiss resort of Gstaad; the bright Californian summer in Palm Springs or the ‘dolce vita’ of the Amalfi coast in the Mediterranean. 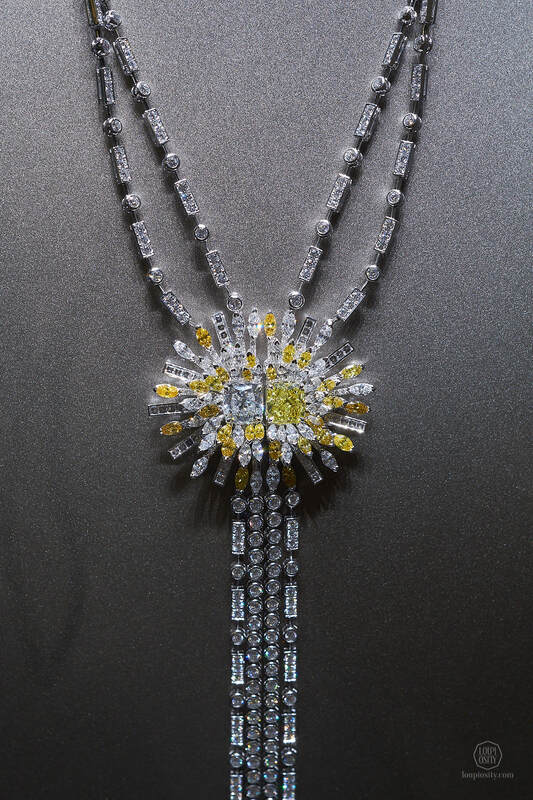 The lights, the colours and the atmosphere have served as a great source of inspiration for the Maison. 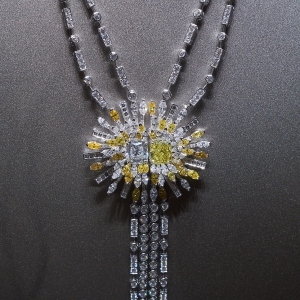 They continue to chase the brightest star it in the 2018 Sunlight Escape collection. 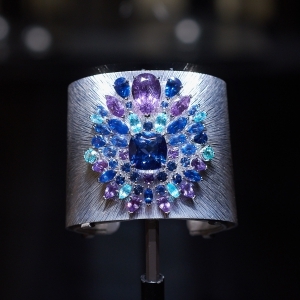 Piaget interpreted the otherworldly lights and the colour hues into high jewellery. 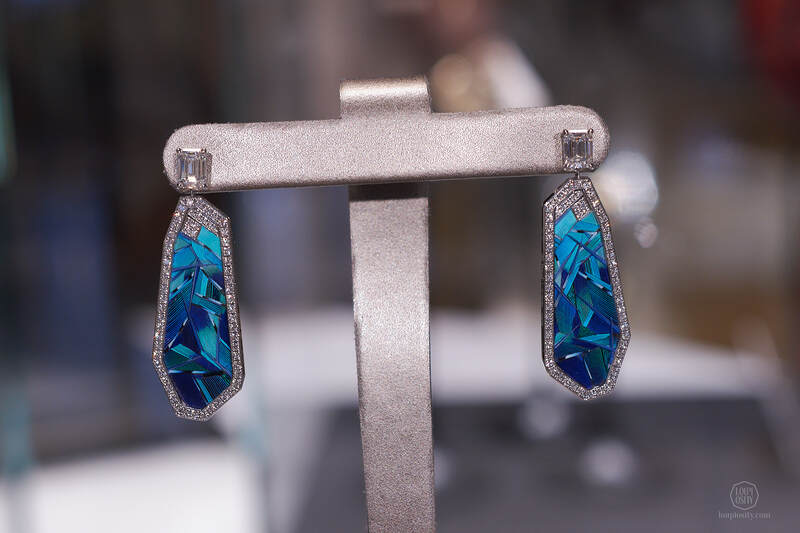 The collection has three main chapters: Warming Lights with pink, white and gold tones; the Exalting Sights with icy blue tones and the Dancing Nights with green and blue gems in flowing motion. 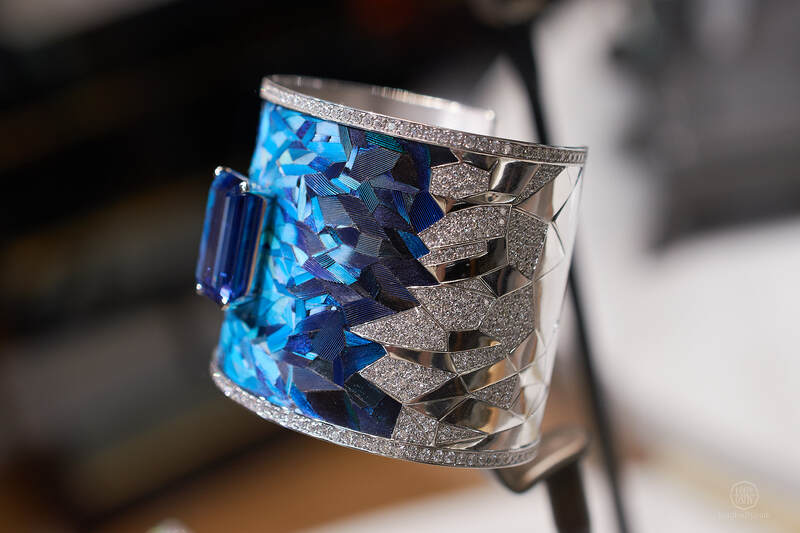 The Colourful Symphony watch, Green Borealis watch or the Green Borealis necklace – all part of the Dancing Nights chapter – are inspired by a special light sensation, the Aurora Borealis. The Northern Lights or Aurora Borealis is an amazing natural phenomenon that can paint the night sky with unearthly, surreal colours – shades of green, pink or violet. There are a few places where you can see northern lights: in parts of Alaska, the northern parts of Canada, the southern half of Greenland, Iceland, Northern Norway, Sweden, Finland and some parts of Russia. 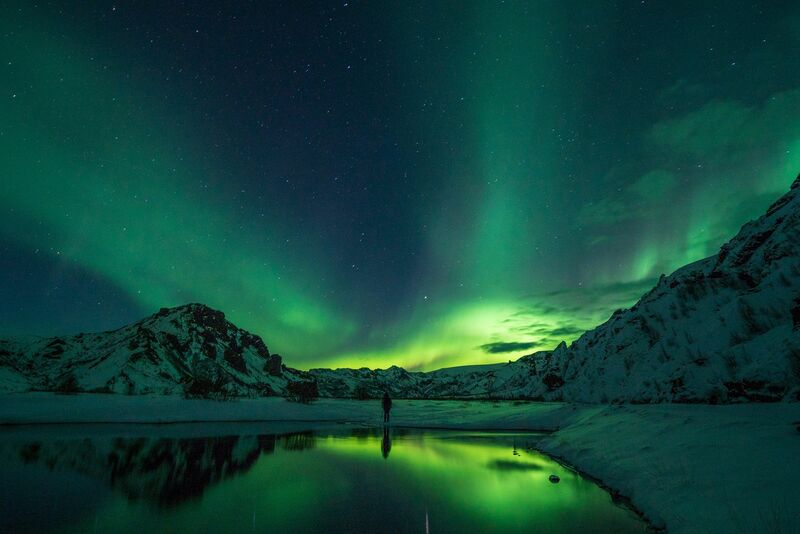 In these countries the Northern Lights are a part of life and a source for art, mythology, and legends. 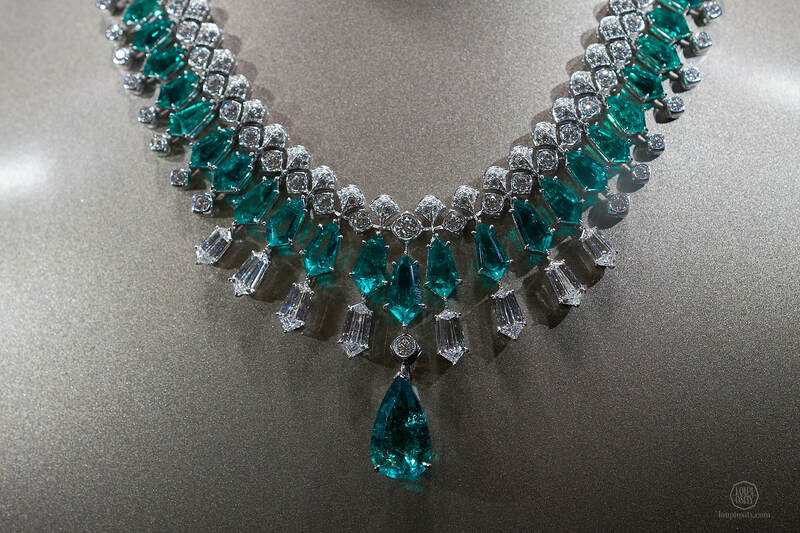 The unique Green Borealis necklace reflects the shades in white gold set with Colombian emeralds (one 7.5 ct pear-shaped stone in the centre and 33 kite-shaped emeralds in a semicircle) and 8 trapeze-cut diamonds and 760 brilliant-cut diamonds all around. 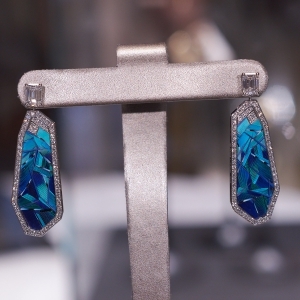 Certainly one of the most emblematic creations in the Exalting Sights chapter is the Blue Emotion Manchette (and matching earrings). 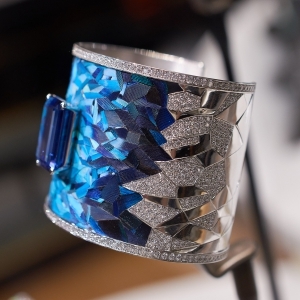 This gorgeous white gold cuff is set with one emerald-cut tanzanite (approx. 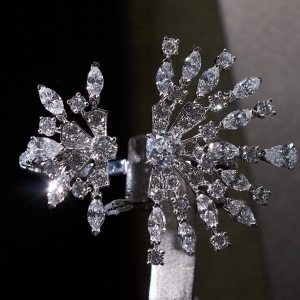 24.36 ct) and 613 brilliant-cut diamonds. You can admire Nelly Saunier’s ‘feather marquetry’ (or plumasserie in French) on four pieces. 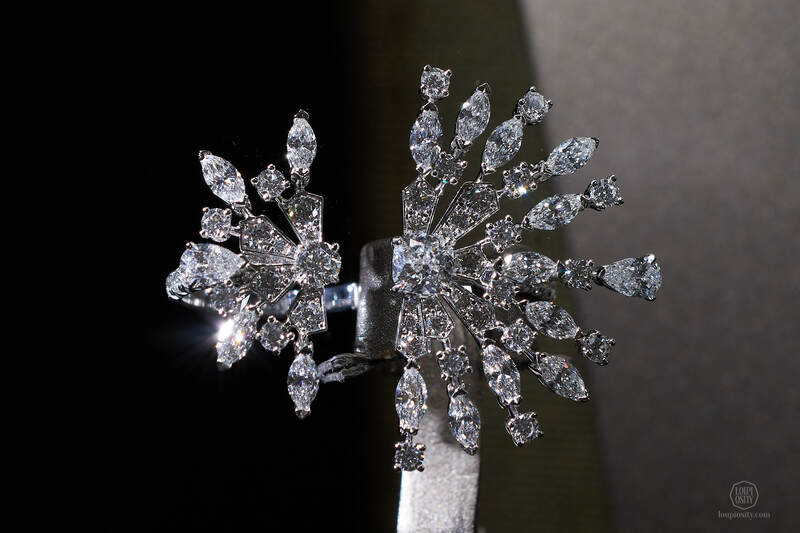 The earrings and cuffs that evoke a snowy landscape illuminated by a radiant sun, the coolness of a glacier and the softness and shine of the snow reinterpreted in feathers. 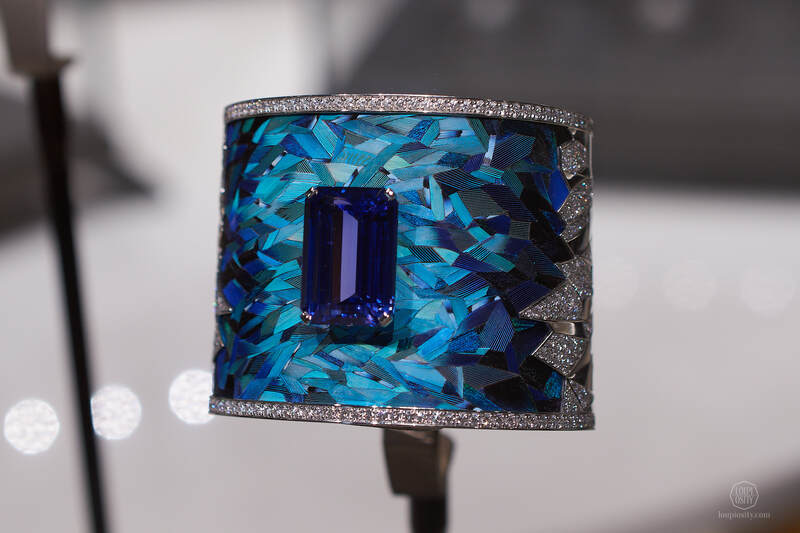 On this unique cuff the different tones of blue surround the deep blue tanzanite beautifully. 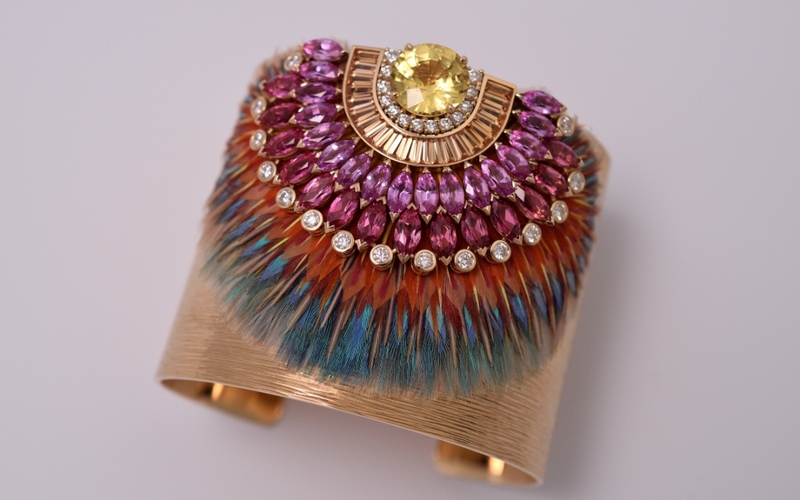 The Warming Lights chapter includes vibrant and sparkling creations with a touch of warmer pink gold. 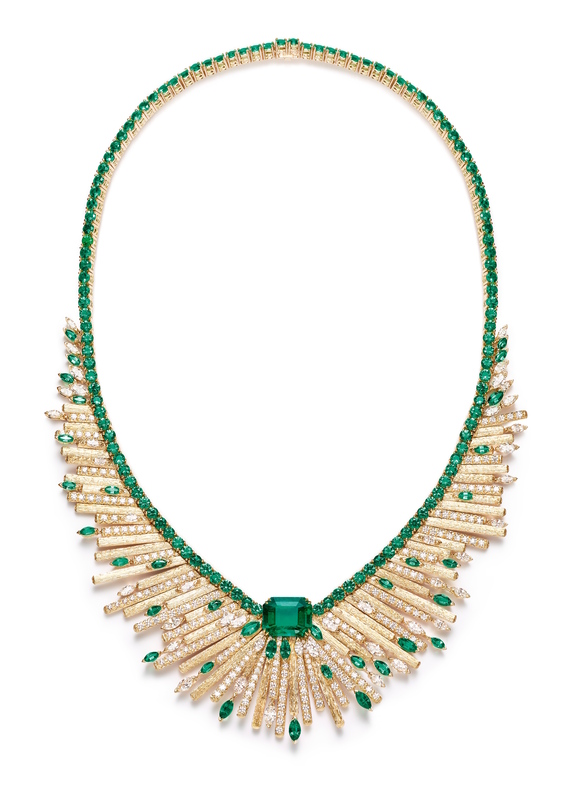 The Midnight Sun Necklace has a 6.02ct emerald-cut Colombian emerald as a solar centre stone, encompassed by dozens of pink-gold engraved batons decorated with marquise-cut diamonds. 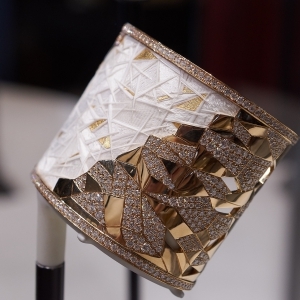 Piaget chose its emblematic goldsmith technique, the ‘palace-decoration’ to engrave the gold.